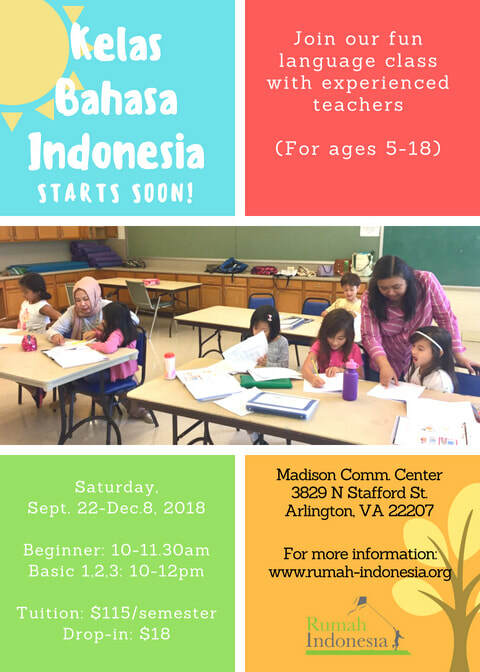 JOIN OUR BAHASA INDONESIA CLASS! Fall Semester starts on September 22, 2018. Foster character building activities that focus on the preservation of cultural activities and Indonesian language usage to maintain Indonesian identity and pride by giving support to learning communities in exploring the educational character of the Indonesian nation derived from the values ​​of local wisdom; Organizing cultural activities through active learning; Collaborate with local cultural institutions, regionally, and internationally to conserve values ​​cultural traditions of Indonesia; and Expanding the reach of Indonesian culture internationally. Through a culturally based curriculum using music, songs, and activities, classes will be conducted entirely in bahasa. We look forward to having fun with your kids while learning Indonesia.